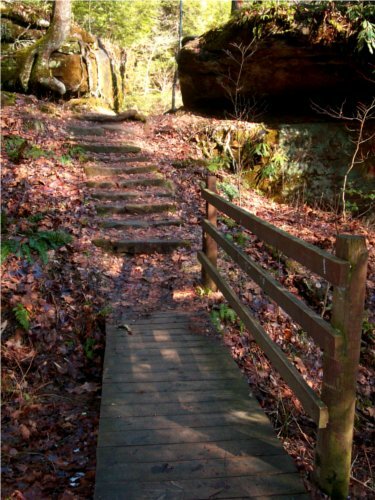 Follow the Rock Bridge Trail, and you arrive at this… wooden bridge? If the trees are full of leaves, it can be hard to spot the rock bridge before you see this more obvious wooden one. As you walk between the stone “walls” you are actually walking “through” the bridge; to your right (as seen in the photo) is the actual bridge’s foot. It can be hard to see until you cross this wooden bridge, where its location becomes obvious. As mentioned before, I proposed in the Red River Gorge and my wife and I returned for part of our honeymoon. My soon-to-be wife walked across this bridge in her wedding dress on the day of our wedding. The (real) Rock Bridge was our backdrop and the first time I saw her in her dress was as she emerged from that path between the stones. It’s definitely not “just a wooden bridge” to us!